First up – my apologies for the pic. I had no intention of this dish hitting the blog but, well it turned out so well I had to gush about it a bit! My love affair with Nduja sausage continues unabated…I may be developing a bit of an addiction here!! The one thing I really love about this spicy Italian sausage is that it is crumbly and seriously picante – it adds so much to sauces and to stuffings like this. Dont expect it to stand up and hold its own physically like a salami..it wont…..it instead subtlety weaves itself into what ever it is you are working with and quite simply super-charges it! 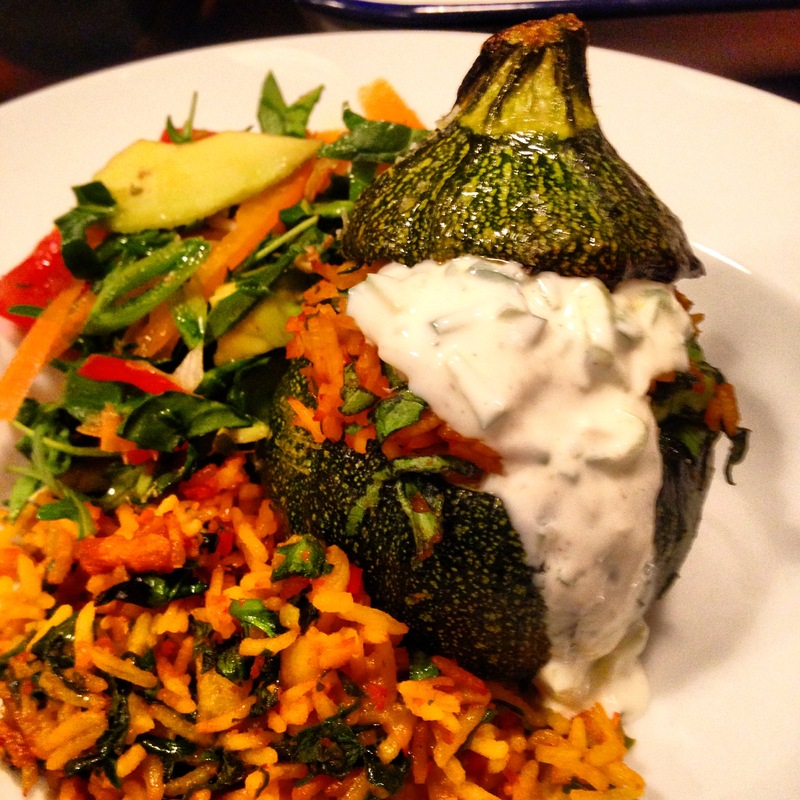 So this recipe was literally born 20 minutes before it hit the plate – it’s a Tuesday night I was faced with a courgette, rice, spinach, Sausage and a serious hunger…the result….a totally killer stuffed veg dish that is going straight into the greatest hits list! You have gotta give this a shot! kick things off by taking the ‘hat’ off your courgettes – sharp knife and take off the top about 2 cms down from the stem. Then very, very carefully hollow out the flesh and chop finely. Next lug some olive oil and salt flakes onto the hollowed out courgettes and ‘hats’ along with the remaining stock and roast in a shallow roasting tray for about 20 minutes or until just tender. Next remove from the oven and spoon in the stuffing and pack well but don’t break the courgettes – pop on the hat and back in the oven for about 5-7 minutes or until warmed right through. Serve with a big robust root salad, some extra stuffing and big spoonful of Greek yogurt…or even better Tzatiki…get a bit Greek with things! Wow, I am glad you posted this. I had one such dish recently that I was so sure was going to fail I didn’t take nary a photo until it was all made. I have never heard of Nduja sausage, and I’m guessing a courgette is a squash? Sorry I am not at all familiar with your country’s terminology for food items, but I AM learning! You are right Kathryn – Courgette is probably better known in your part of the world as Zucchini. These are round ones and they are part of the Squash family. They are perfect for stuffing!! Ndjua (Ndooya) is a spicy Italian sausage – very picante and firey, it’s a little like the cooking type or raw Chorizi so it isn;t aired dried. Masterful stuff Rory. The cool of the courgette balanced by the fire of the sausage. Delicious. Anything is better with sausage! And this dish is very dramatic looking…love it!